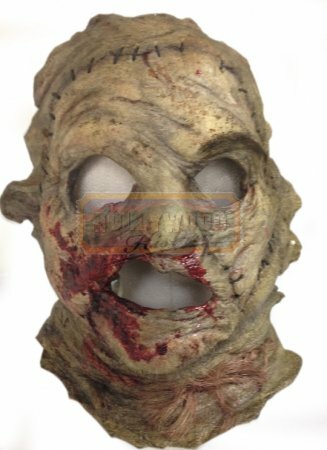 Leatherface Hero Bloody Mask [CM3Dbloody] - $0.00 : Hollywood History Online, Discover the Magic and Bring Hollywood Home! A young woman travels to Texas to collect an inheritance; little does she know that an encounter with a chainsaw-wielding killer is part of the reward. Picking up after the events of the original film, the people of Newt, Texas, led by Mayor Burt Hartman, burn down the farmhouse of the Sawyer family for their role in aiding Jedidiah "Jed" Sawyer (Dan Yeager), also known as "Leatherface", in several murders. 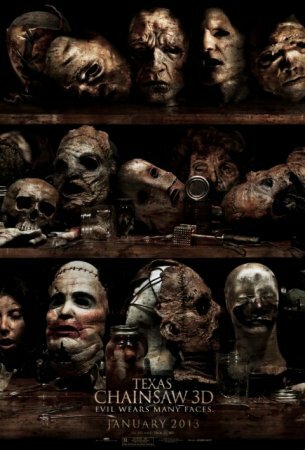 From the 2013 slasher film Texas Chainsaw 3D, this is Leatherface’s hero bloody mask. This version was seen towards the end of the film when Leatherface gets in the fight at the slaughter house and you see this mask on screen with the blood from his injuries and the mask he wears throughout the end of the film. Among being a major piece of this horror icon, the mask can also be seen on the films movie poster.